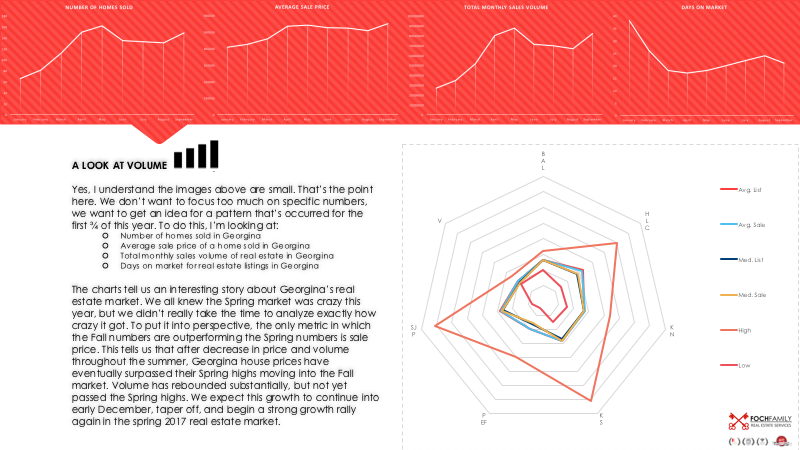 The charts tell us an interesting story about Georgina’s real estate market. We all knew the Spring market was crazy this year, but we didn’t really take the time to analyze exactly how crazy it got. To put it into perspective, the only metric in which the Fall numbers are outperforming the Spring numbers is sale price. 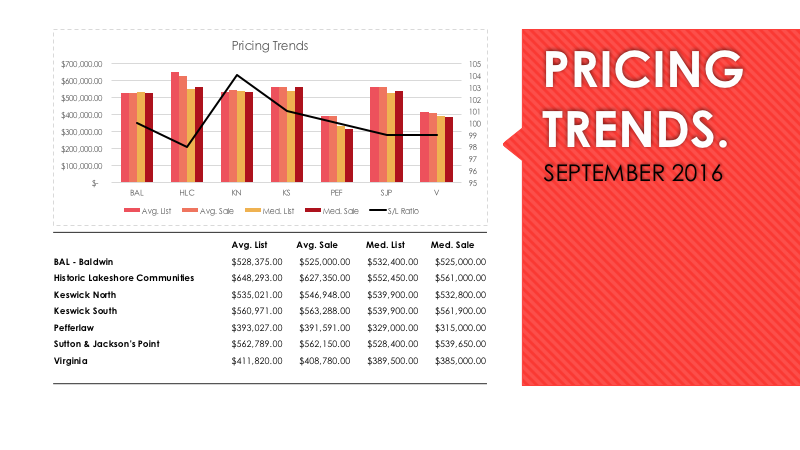 This tells us that after decrease in price and volume throughout the summer, Georgina house prices have eventually surpassed their Spring highs moving into the Fall market. Volume has rebounded substantially, but not yet passed the Spring highs. 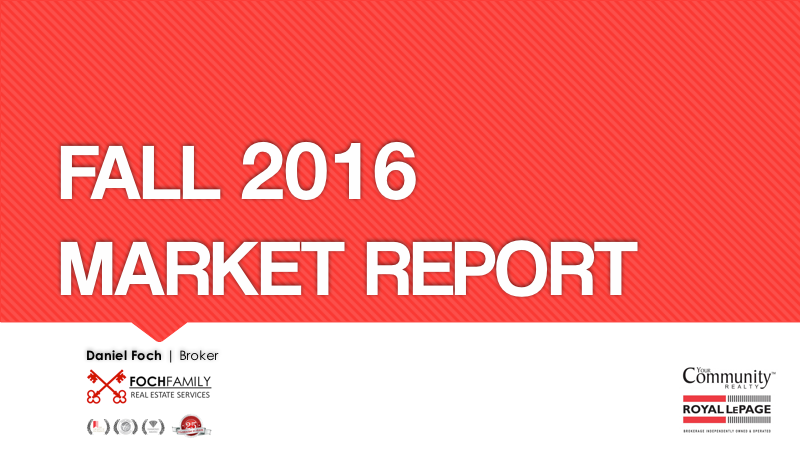 We expect this growth to continue into early December, taper off, and begin a strong growth rally again in the spring 2017 real estate market. 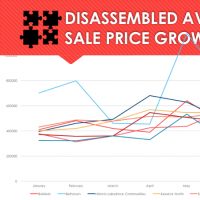 When we break down the metrics that explain price growth, we look at how the average prices, highest prices, and lowest prices are moving. Figure 1. Growth in Average Price is relatively uniform, but moving upwards at a slow and steady pace, with a couple of anomolies. Figure 2. Growth in Highest Price is quite sporadic, but moving up at a higher rate, with a growing gap between highest and lowest, and fewer anomolies by comparison. Figure 3. Growth in Lowest Price experienced relative volatility among areas throughout the year, and gradually tightened into a much smaller, more uniform price floor basis. Over the past 10 months, we’ve reached an equilibrium in the lower end of the market, with average annualized low prices falling within a couple standard deviations of one another. The price floor has grown, but it’s grown at a much slower rate than the higher-end of the market, which still seems to be struggling to find an equilibrium price or volume area. This tells us that the lower end of the market has a lot less price elasticity of demand. This is presumably brought on by new household formation and first-time homebuyers. We expect this trend to continue, and the price floor to settle, especially with support from new federal mortgage legislature. 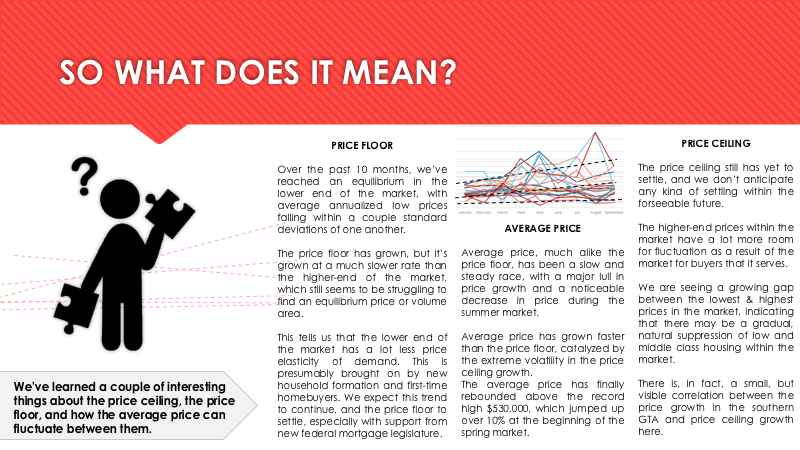 Average price, much alike the price floor, has been a slow and steady pace, with a major lull in price growth and a noticeable decrease in price during the summer market. Average price has grown faster than the price floor, catalyzed by the extreme volatility in the price ceiling growth. The average price has finally rebounded above the record high $530,000, which jumped up over 10% at the beginning of the spring market. The price ceiling still has yet to settle, and we don’t anticipate any kind of settling within the forseeable future. The higher-end prices within the market have a lot more room for fluctuation as a result of the market for buyers that it serves. We are seeing a growing gap between the lowest & highest prices in the market, indicating that there may be a gradual, natural suppression of low and middle class housing within the market. 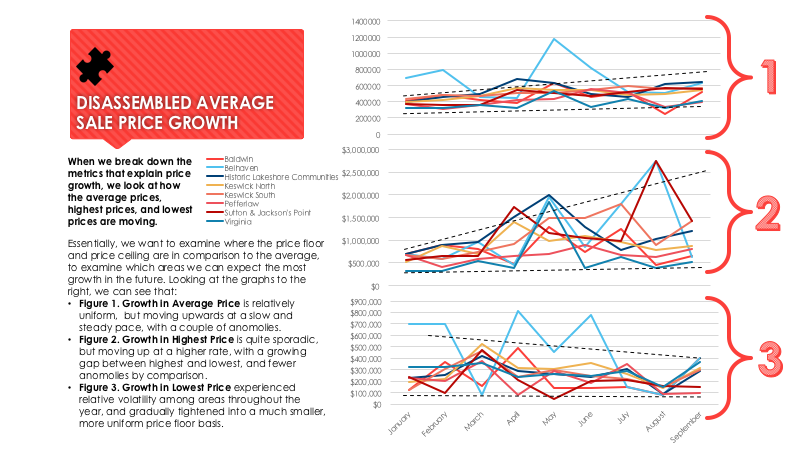 There is, in fact, a small, but visible correlation between the price growth in the southern GTA and price ceiling growth here.